I got this awesome chromecast thing (picked it up at bestbuy) and wanted to re-broadcast shows to my tv, which I otherwise would watch on the laptop or by connecting the laptop via an hdmi cable. It works, and the idea is really great. Looks like youtube works really well, but that was not the idea. Re-broadcasting via the laptop sometimes result in a bit sluggish video and blurred pictures. Granted it works, but it is not as good as using the hdmi cable. My first thought was, well chromecast is over wify – mybe my connbection, but I strongly doubt it as if the a laptop is on the ethernet connection it is exactly the same. So I still like the little dongle, but I’m not sure I will use it much .. I wish it was better in this respect. 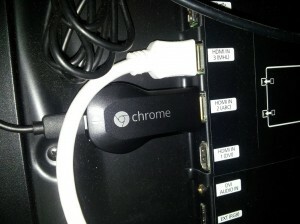 This entry was posted in Gadgets and tagged Chrome, Chromecast, Gadgets on Monday, September 9, 2013 by Martin. I’m still wondering why I never seen a web browser with a good sticky note feature. Opera, Google, FireFox and IE all are “pretty good browsers”, but all lack this feature and so far I’ve not seen an add-on doing this. Basically I wish I would have a sticky note option to which I could add a note to the Internet and see this as I browser. I could add a note to a web page and next time I get to this page I will see the note pop up. Maybe the note is more general about the website and I could maybe have added it to the server and it Â will show up the next time I enter this server again. The advanced Sticky Note would be a note on a subject. I’m looking to buy a new harddisk and start to research the subject. As I research I write notes down “stuck” to the manufactor model number. At 3am I go to bed and next week I’ll try again … I start to look at disks and when a webpage as the model number I’ll see my notes related to it. Anyone? Why do we not have this? This entry was posted in Gadgets and tagged Browser, Gadgets, Idea, Sticky Notes on Tuesday, February 2, 2010 by Martin. Last year, just before a large roadtrip, I was looking at buying a GPS logger to log where we drove, but also to tag our pictures with the GSP location where it was taken. After reading this review I decided to buy a Qstarz BT-Q1000P. This entry was posted in Gadgets and tagged Gadgets, GPS, Review on Saturday, January 10, 2009 by Martin.